Every bride and groom differ and are looking for something individual to them, so we make sure we are able to deliver on this by ensuring we understand every element of your day. From the style of your dress to the shades of pink on your wedding stationery, every detail you share with us helps us to design floral pieces that will compliment your wedding. Whether you have a clear idea of the colour scheme and floral pieces you want or you just don’t know where to start, we can work with you to bring your ideas to life. After the initial enquiry and introduction via email with a possible meeting at your venue or at Vervain’s Studio we aim to ensure all aspects of your wedding are covered. From mid-Spring to late-Autumn we have an abundance of flowers in our flower garden, ensuring that all the weddings we work on are filled with copious amounts of British-grown flowers. Having the flower garden on site at our studio means we are able to select the ideal exquisite blooms for your floral designs, catching them at their fleeting moment of perfection. If you would like to talk through your wedding day with us, please fill in our enquiry form (link below) or alternatively drop us an email to studio@vervainflowers.com to begin this exciting process. Vervain designs for couples that understand and appreciate how flowers can enhance their day and want the flowers to create an aesthetical impact, expressing their personalities and the atmosphere of their wedding. We cater for weddings of all sizes, all over the UK, and take on a few select destination weddings each year. Whether you want a large wild archway to frame your outdoor ceremony or clusters of little ceramic pots to line your dinning tables we will work with you to create your dream floral designs. Our bridal bouquets are wild, loose and romantic, filled with all of the best seasonal flowers. We take time to gather the most beautiful flowers that are blooming, considering the perfect shape and size to suit you. Our aim is to create a bouquet that captures the look and feel of your wedding flowers, whether it’s that focal garden rose that matches your bridesmaids’ dresses or the delicate trailing foliage that compliments the intricate details of your dress. 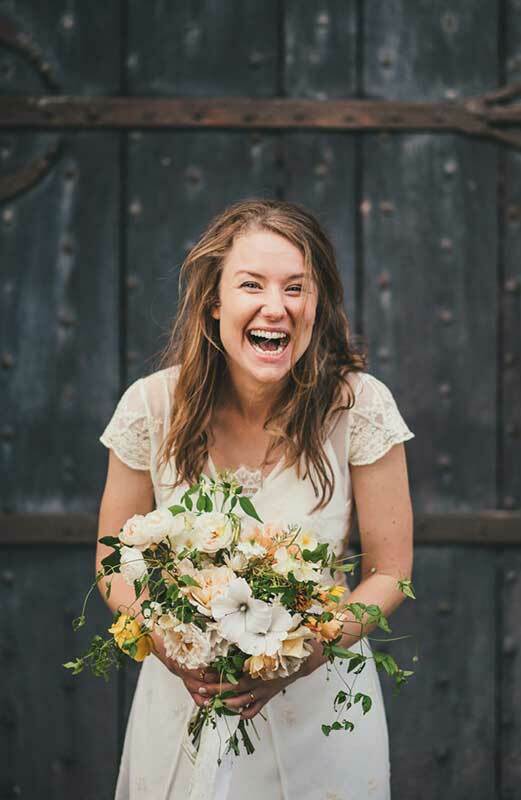 We love nothing more than seeing the excitement on your face when we deliver your bridal bouquet to you. At Vervain we offer a wide range of vessels and vases to create your florals in, we have large elegant urns, antique brassware bowls, cut glass bud vases, mixed style vintage ceramic pots and handmade pottery bowls to name but a few. Pairing the right props with your flowers and styling is so important to creating a cohesive aesthetic for your wedding florals.